And Special Christmas Pricing for our Customers, 30% off on all Pre-Booked SD38-2 Orders Placed by Dec 23rd 2006. New production run of the EJ&E and DM&IR SD38-2 with new numbers and a brand new DM&IR design with a 4000 gallon fuel tank and 3 cylinder truck sideframe! Click here to see them! The EMD SD38-2 was produced from November 1972 through June 1979. 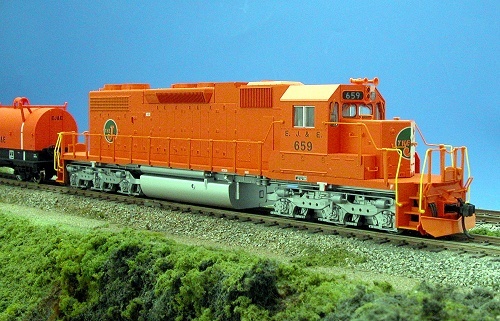 Capable of generating 2000 horsepower, the SD38-2 was essentially the same locomotive as the 4-axle GP38-2 while being built on the 6-axle SD40-2 frame. Although officially considered a medium road-switcher, the SD38-2 is frequently identified with its heavy duty in the steel industry. The locomotive has also been used in both mainline and yard duty by railroads such as the Union Pacific and Chicago & North Western when looking for extra tractive effort. These models will be accurate to the roadname/engine number with regards to the fuel tank size, truck brake cylinders and dynamic/non-dynamic brake hatch. They will, of course, feature the precision detail and powerful five-pole motor with dual brass flywheels that KATO models are known for. The models will be equipped with KATO magnetic knuckle coupler, 8-pin DCC socket and golden-white LED headlight. These models will be "Sound Friendly," featuring the capacity for the optional installation by hobbyists of a 1.1" (28mm) diameter speaker in the fuel tank for use with onboard sound unit (speaker and sound unit available from other manufacturer). Hobbyist-install detail parts will enhance the enjoyment of these models. NOTE: Our March advertisement inadvertently indicated the speaker size was 1" for this model. The correct size appears above. The Elgin Joliet & Eastern promotes itself as "Chicago's Outer Belt," circling around Chicago to give itself a large advantage over other carriers that must pass through congested Chicago railyards. Because of this, it is common to see many different kinds of trains and equipment taking the "short cut" around, not through, Chicago. The EJ&E also regularly provides service to the many Chicago area steel mills, particularly with their widely recognized steel coil cars. The EJ&E interchanges with virtually every other railroad that comes through Chicago. Duluth, Missabe and Iron Range, with an attractive maroon and gold "Arrowhead" scheme, is the largest and most well-known iron ore railroad. The DM&IR hauls ore extensively out of the mines of northern Minnesota, connecting at one time or another with CN, BN, UP and others. When one thinks of long strings of Iron Ore or Taconite cars, they think of DM&IR. MSRP $140.00 [December, 2006] ? THESE MODELS ARE AVAILABLE FOR IMMEDIATE DELIVERY !